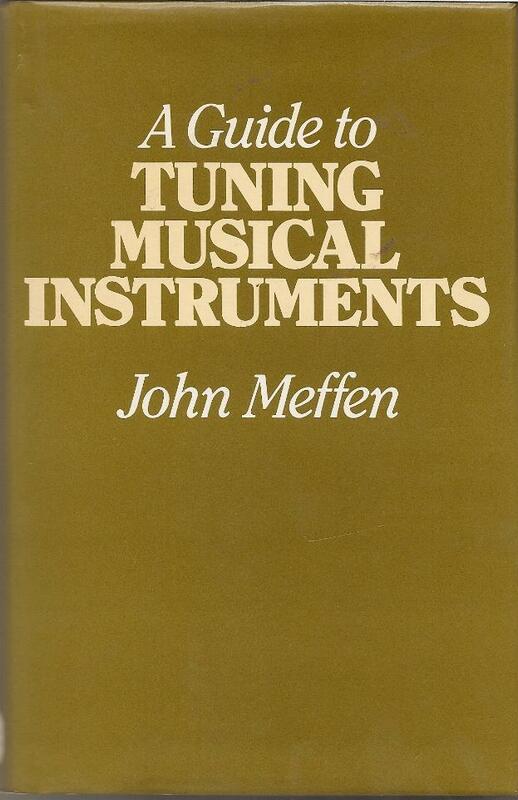 This page contains information about technical books covering tuning, repair, design, regulation and other aspects. It is not by any means an exhaustive bibliography, just my comments on some works I have on my bookshelf. 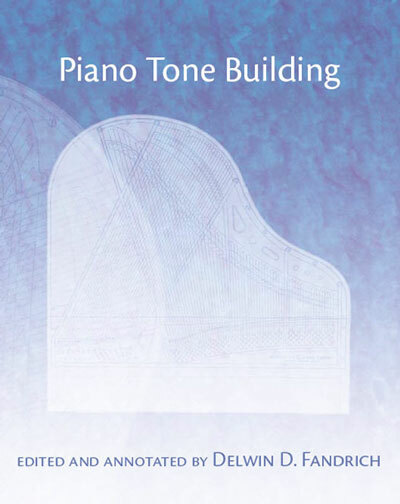 This new book is the best ever produced on piano technology. In due course I will put up a separate page about it. Meantime, you will be thrilled to know, gentle reader, that this very website which you are sapiently perusing, is listed as a resource in the Bibliography of this splendid new textbook. This is not the cheapest book, but is certainly the most comprehensive and up to date. 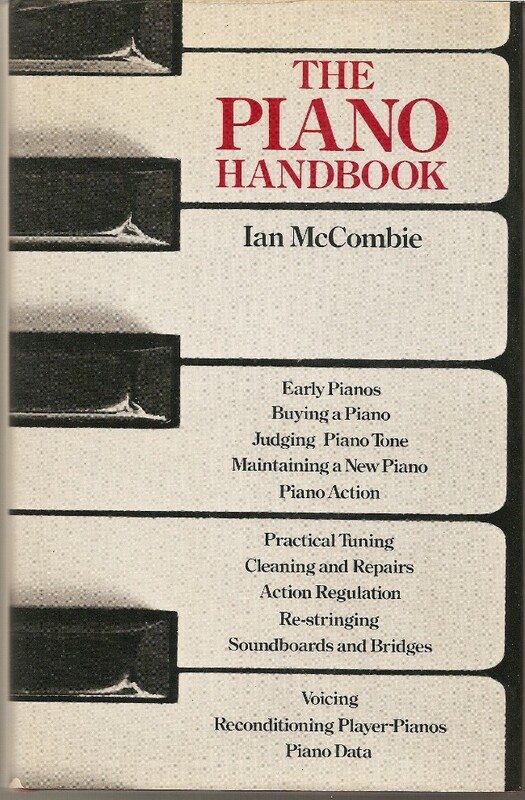 This slim 1978 book was the first I ever obtained on how pianos work. It's out of print but you might find a secondhand copy. 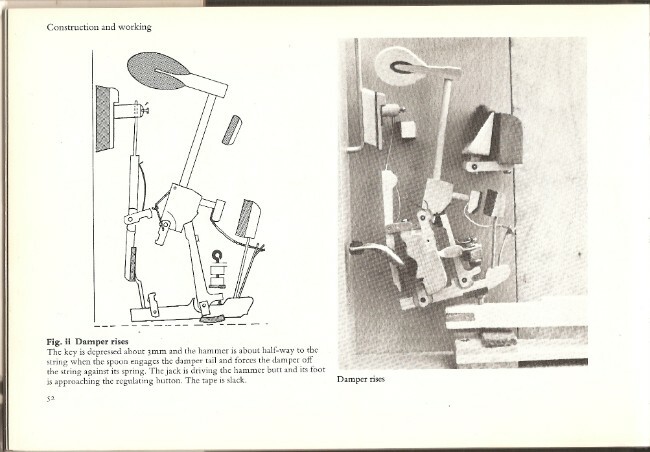 It has good descriptions of how upright and grand piano actions work. Having line drawings side by side with photographs showing each stage of a key being played is visually helpful (see example below). Smith later published another book, Pianos; Care & Restoration. Line drawing with accompanying photo, in Pianos in Practice. 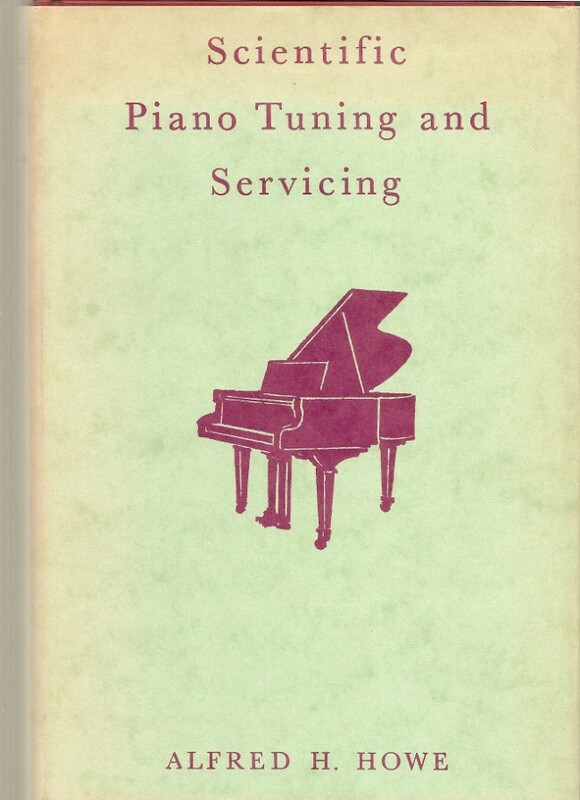 This 1946 revision of a book originally published in 1917 was for years considered the standard text on piano tuning and repair. Actually it has very little on repair. Understandings and methods have moved on since 1946 and this is not now the place to start. It's a solid work, mind you, for its era. The writing style is rather of its time, though I think the usage "an unison" must have grated even in 1946. I've shown the frontispiece above rather than the front cover, which has no print. 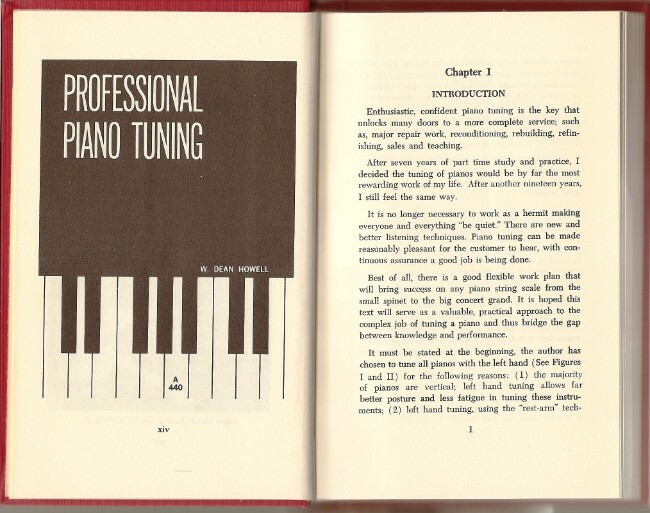 Arthur Reblitz's mid 1970s book was a huge leap forward from any previous piano technical book. It was the first to explain repairs in detail and with photographs. The explanations and tables setting out the theory of tuning are a model of clarity. 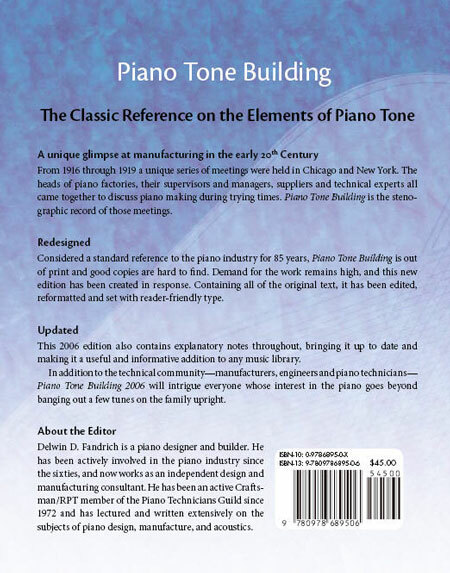 This quickly became the standard text and remains a most valuable part of the literature; a very good place for anyone interested in piano technology to start. Other texts have since taken tuning and repairs to new levels of thought and description (see Pianos Inside Out, above), but Reblitz is still excellent. It's now on a second edition, 1997, and some have said that the clarity of some of the photos has suffered a little. Howe's book dates from the same 1940s era as the revised edition of W. B. White, and is a worthy challenger to it. There is a nice approach to showing various schemes for setting the temperament octave, giving these in musical notation. Like White, there isn't too much on the repair side. Also like White, superseded by more modern and better texts. But still nice to have on the bookshelf. Thinking on piano tuning has developed in recent years. Older theory concepts have been shown not to be adequate to explain and describe pianos, their string scales, and how tuners deal with them. This lengthy 2007 text approaches the philosophical in the depth of its discussion, and at 626 pages certainly offers detailed analysis. 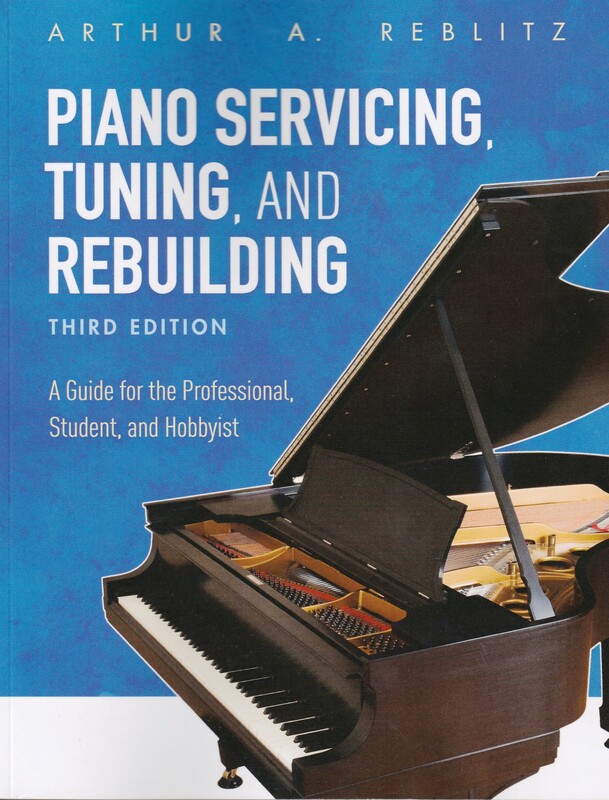 It's perhaps not the easiest starting point for someone coming new to pianos, but it's a welcome addition to the literature. 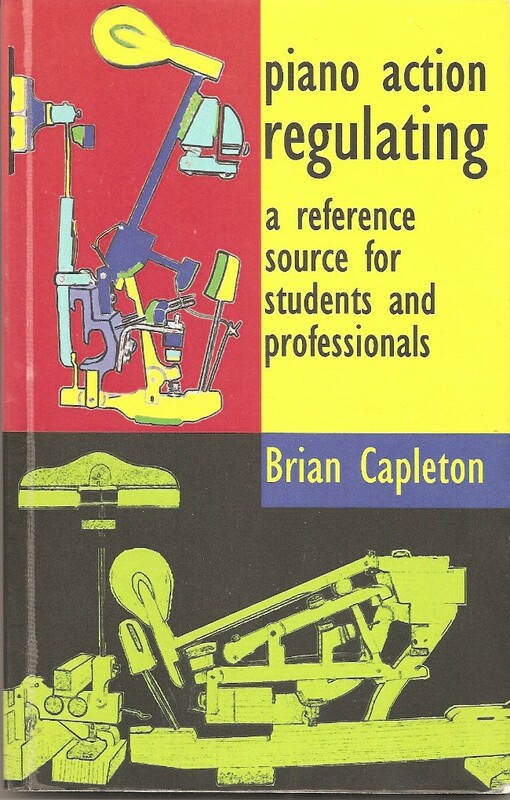 This slim volume is a pratical book designed to cover the regulating knowledge needed for the Gity & Guilds certificate. I don't think the City & Guilds Certificate is offered by any college today, the market having declined. But this is a very useful little book, clearly explained. 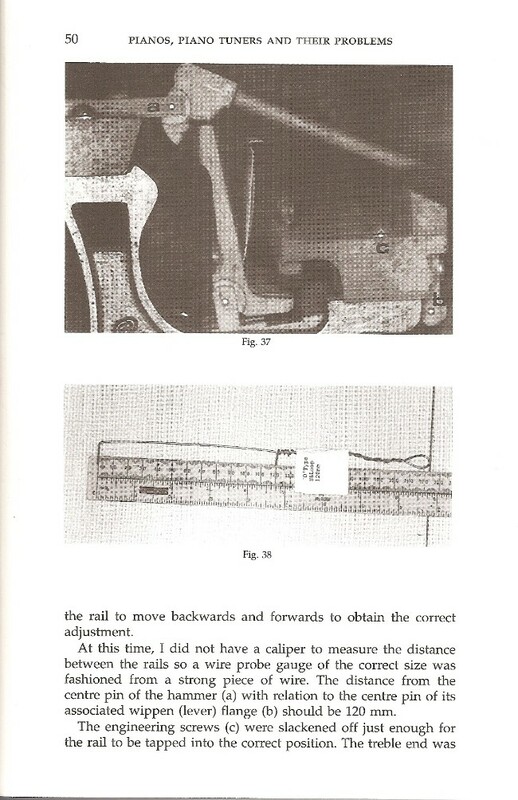 A very different kind of work from Dr Capleton's Tuning book, it's a practical how-to book, and does not go deeply into theoretical design geometry considerations. The Anatomy of the Piano. Herbert Shead. Heckschers. A simple and accurate method for amateurs? That's a larf! 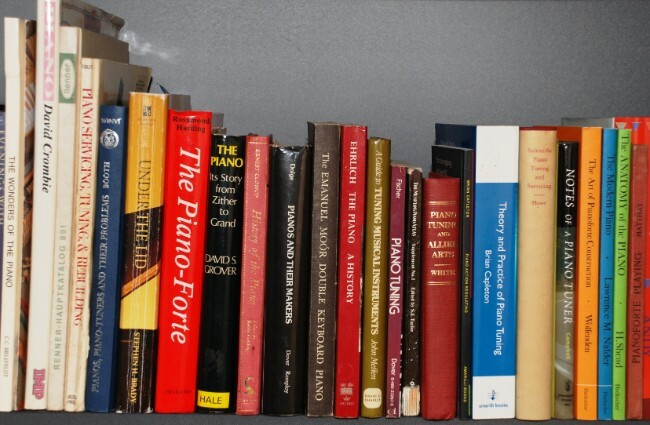 Tuning a piano is never simple and arguably never accurate, even for professionals. This is a facsimile reprint of Fischer's 1917 book, produced presumably because modern technology makes it easy to do so and it's out of copyright. It has a place on the bookshelf as a historical text. It might help a beginner to think about the process, but it's really not nowadays the best starting point now for anyone intent on learning how to tune. This book is just super. 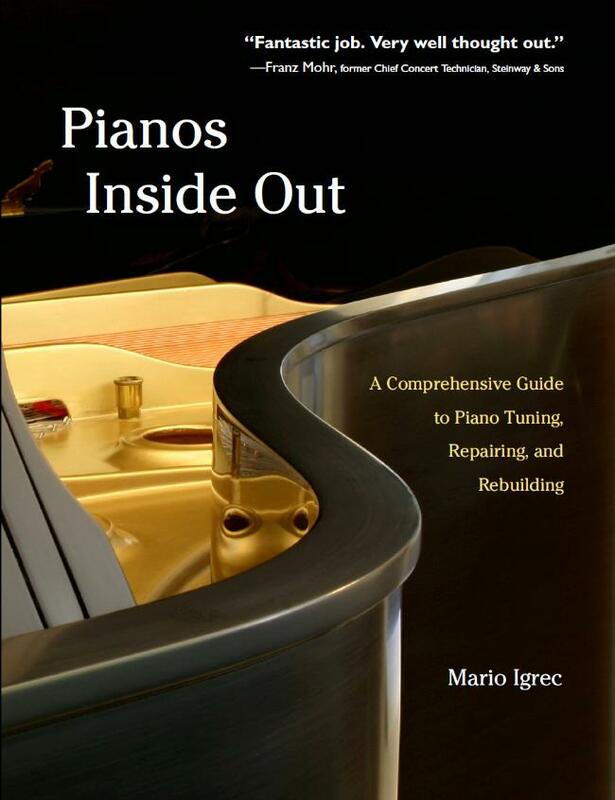 It covers lots of entirely practical hints and techniques that are of great value to the technician working on high-end pianos for concerts and recordings. 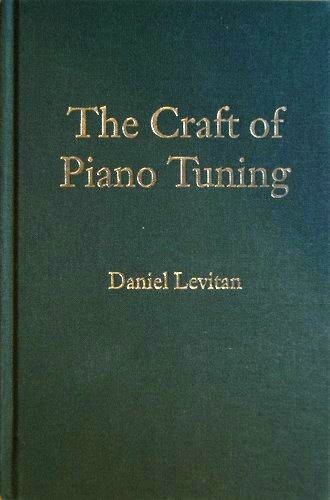 The technical chapters are interspersed by informative and often amusing observations and experiences from pianists and others involved in recordings, piano preparation and so on. A hugely valuable and most enjoyable work, taking up where Reblitz left off. 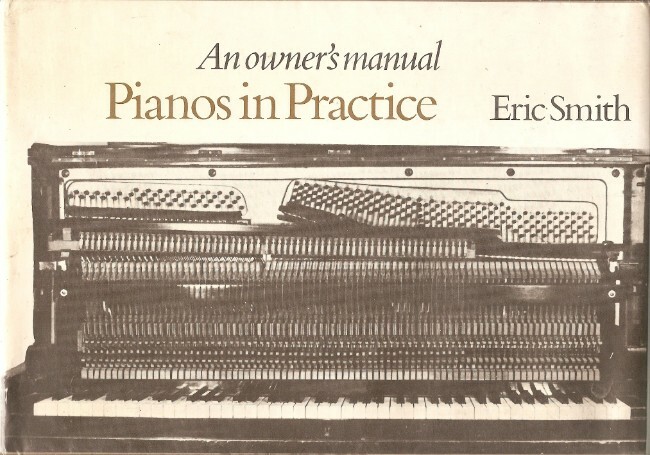 Although it's mostly a technical work, I think it would make enjoyable reading for any dedicated pianist. 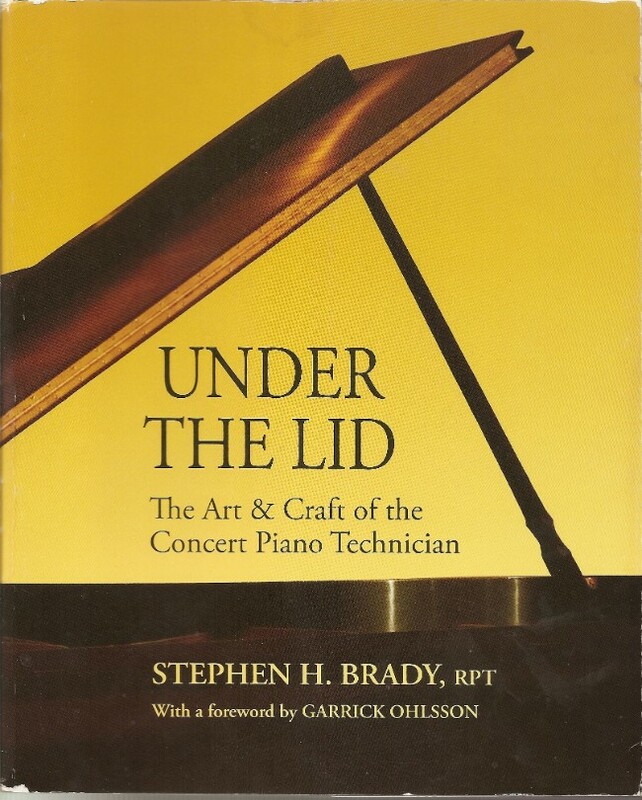 A collection of observations, techniques and anecdotes by a retired UK piano technician. Mr. Booth is to be congratulated on his assiduity in recording things in black and white photographs, before the advent of digital photography. 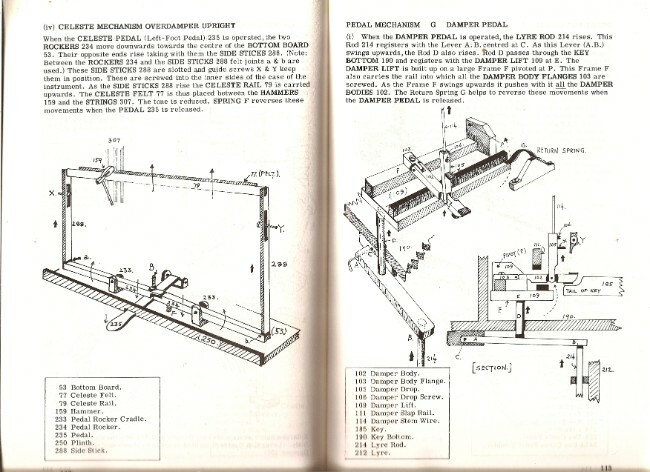 The chapter on regulating the D-type Spring & Loop action found in many small English grand pianos is very worthwhile, as not many books cover this - see page below - (Dr. Capleton's regulating book, see above, is the only other I know of). Out of print now, but you might find it secondhand. 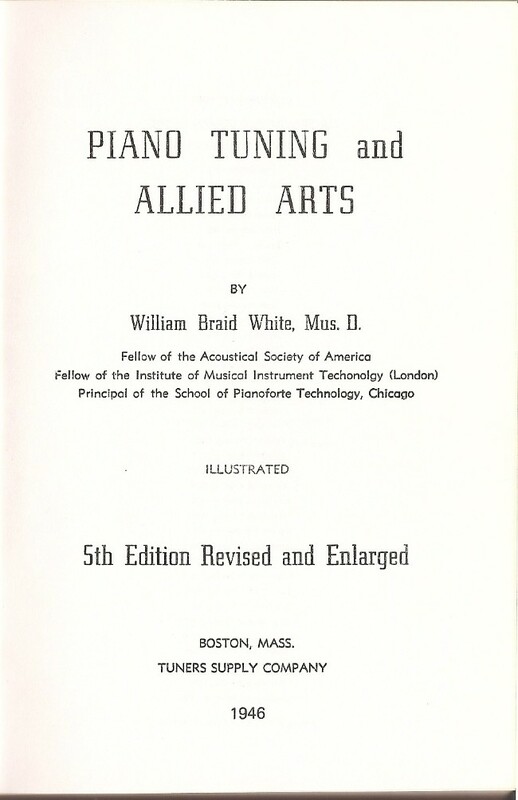 This 1969 text by a leading light in the American Piano Technicains Guild offers a useful update to W. B White's 1940s book. It has good information, but is a bit dated now. 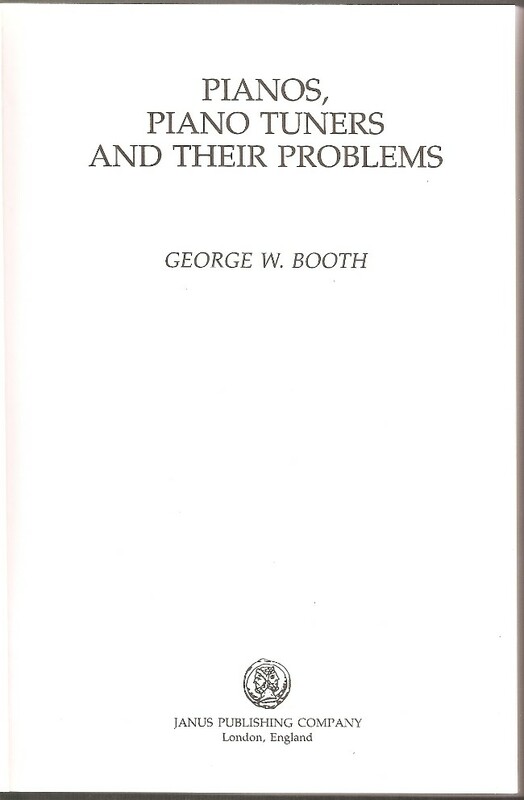 This 1981 text by a Canadian technician is quite well-illustated and covers various repair topics in a practical way. It's not the most comprehensive text available, but still a good addition to the bookshelf. 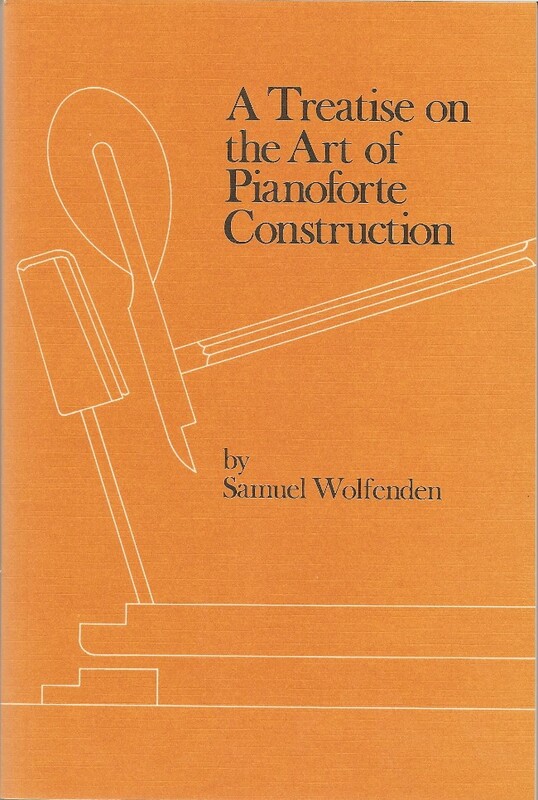 A Treatise on the Art of Pianoforte Construction Samuel Wolfenden, 1916 Republished by Heckscher & Co Ltd 1989. 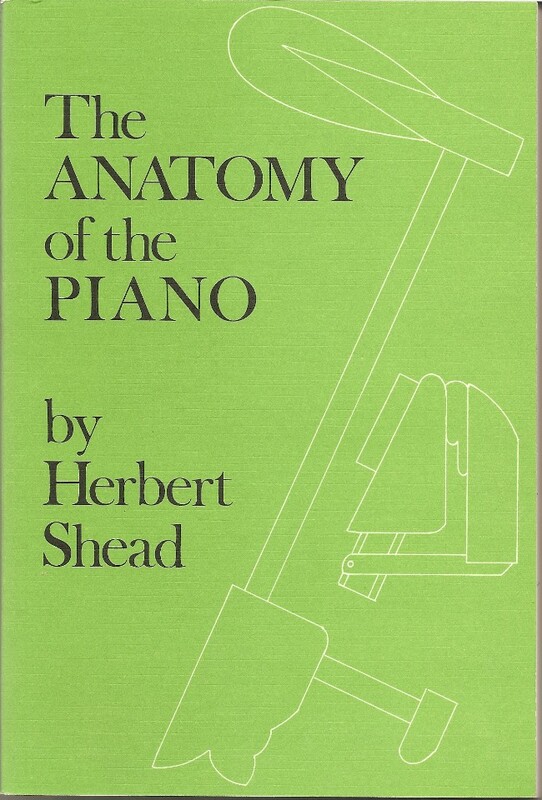 This may be regarded as a historical text, perhaps better included in the historical piano books page to follow, but it is in fact a technical text by a leading figure in the UK piano industry at the start of the 20th Century. No book had hitherto covered all this technical information about scale design and the design and contruction of the piano. It probably can't be regarded as a 'how-to' text in terms of today's manufacturing technology. But the design factors it deals with are still the significant ones. Credit is due to Heckschers for keeping this title in print. This is a superb text. 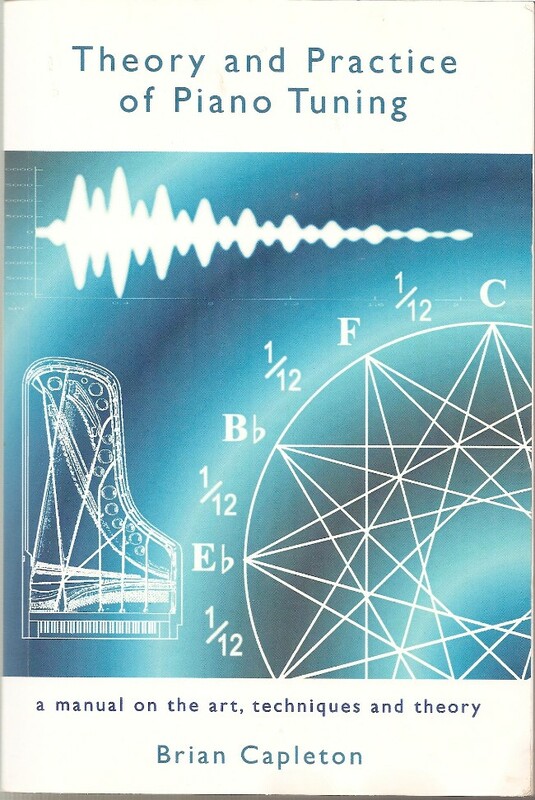 Since the days of W.B White's once-standard Piano Tuning and Allied Arts of 1946, and even since Reblitz' 1970s book, thinking on tuning and understanding of the behaviour of piano strings, have advanced considerably. This work represents a thoughtful, well-considered and well explained approach. The beautifully clear drawings and charts are very helpful in understanding inharmonicity and the forces in the tuning lever. Anyone wanting to keep up with the latest thinking should have this book. 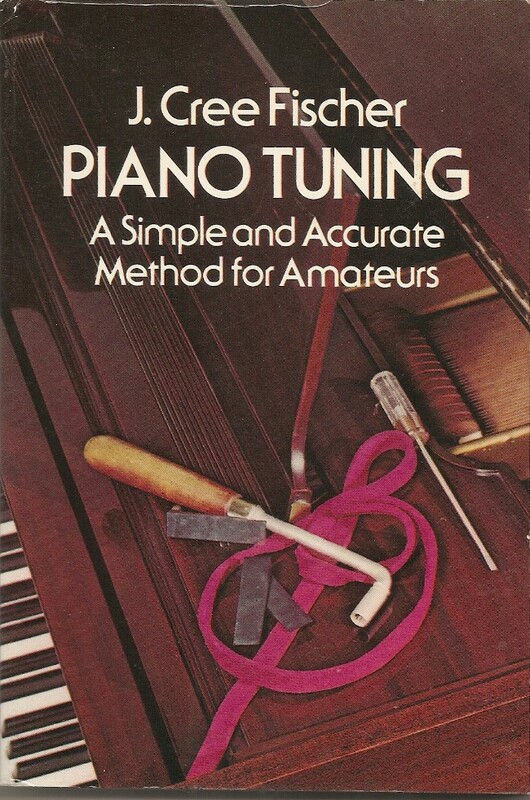 This is a handy work for piano tuners, not because of its coverage on piano tuning - there are plenty of other books about that - but because of its general discussion of tuning and temperament and the information it includes about the tuning of other musical instruments. Dr. Meffen was a Principal Lecturer in music and his explanations are very good. It seems to be out of print now, but there are secondhand copies available.